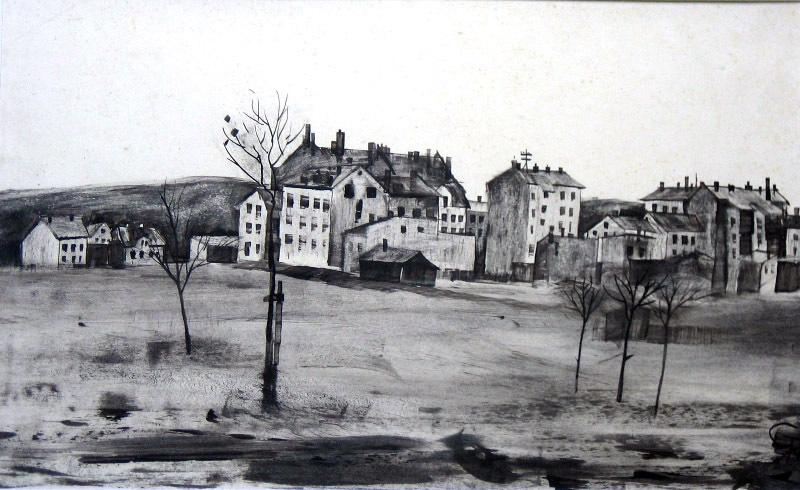 „Pariser Vorstadt“ (Suburbs of Paris), around 1925, 23cm x 37cm, ink and crayon on paper. Gottfried Richter was born in 1904 in Offenbach am Main. Before studying at the school of arts and crafts (Kunstgewerbeschule) in Offenbach, he was trained as decorator. After 6 semester, he dropped out of arts and crafts school and began to travel to Paris and to the south of France. In 1923, the Galerie Flechtheim & Kahnweiler in Frankfurt am Main contracted him as gallery artist. He participated at the exhibitions of the „Darmstädter Gruppe“, the „Bund Offenbacher Künstler“ and in 1928 at the World Fair in Chicago, USA. After living in Vienna and Frankfurt in the 1930ies, he had to serve as a soldier in Norway and was captured. In 1946 he returned from captivity in France and moved to West-Berlin then settled in 1961 to East-Berlin where he died in 1968.